While the clarity of our imaging hopes to give women – and their doctors – a new understanding of what’s going on inside, what happens on the outside matters too. 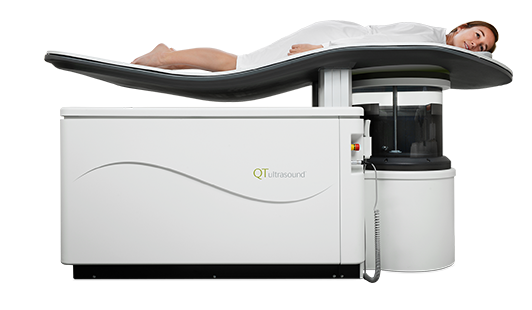 The QTscan provides high fidelity 360° results with no radiation, no compression, and no injections, all while delivered in an environment designed around the comfort and peace of mind of the patient. These are real women* and their real stories. They are the stories of women everywhere. We believe that patients should participate in the decision making on their breast health journey. While the QTscan is an innovative, emerging technology, women want to be informed about all their options. The real goal for healthcare providers in the field is to educate, empower, and provide the opportunity for women to get safe regular screening. About 1/3 of all women who should get routine mammograms do not. Pain due to breast compression during mammography and the anxiety associated with such pain is an important reason many women avoid getting a mammogram or do not return for testing at appropriate intervals. The QTscan allows for painless breast imaging with absolutely no compression, and safe imaging with no x-ray radiation unlike mammography and no administration of contrast agents unlike the majority of breast MRI scans. Our goal is to provide a technology that will allow women to get screened earlier and as often as necessary, with no risk. The QT Ultrasound Breast Scanner has FDA clearance for use in breast imaging as an adjunct to mammography. The device is not intended to be used as a replacement for screening mammography, at this time.